Can we get a round of applause for the writer, director, actress, and producer Issa Rae? Plus, she's natural! This week, she appeared on the cover of Complex magazine. The "Insecure" creator rocked a red form-fitting outfit and big Afro. On Instagram, Rae said she was channeling her favorite heroine, Pam Grier. You can always count on the 32-year-old to rock a new natural hairstyle! Issa Rae's natural hairstyles include twists, puff, updos, cornrows, and a lot more! Her hairstylist, Felicia Leatherwood who is also Skai Jackson's stylist, keeps her hair on point! Earlier this month, Issa Rae appeared in an issue of the Hollywood Reporter for their Comedy Actress Roundtable. The producer rocked a pink suit and big cornrows going back into a puff. She came through with the classic 70's look! 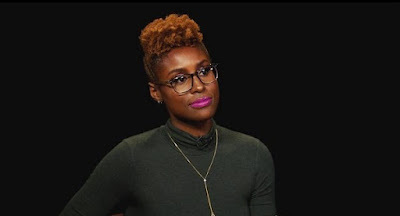 In 2011, Issa Rae's web series "Misadventures of an Awkward Black Girl" came out on YouTube. The series focused on the character "J" and her "awkward" love and work life. The series ended in 2013 after two seasons. The MisAdventures of Awkward Black Girl book was published in 2015 and appeared on the New York Times best seller's list! Unlike the web series, the book contained Issa Rae's memoirs. Her show Insecure on HBO first aired in 2016. Last night, episode 1 of Season 2 aired. 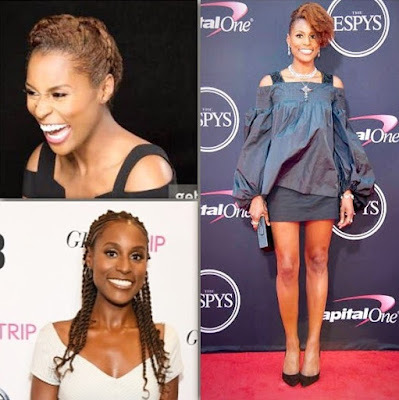 What do you think of Issa Rae and her natural hairstyles? Black History Month: Diahann Carroll as "Julia"